I published my first book October 5th and ever since that day my life has not been the same. I’ve been a writer all of my life. I began on manual typewriters and pads of paper. I wrote out of a passion for writing. I have files and stacks and stacks of papers on which I’ve written poems, short stories, editorials, etc. The landscape of authorship and publishing is undergoing an revolution that promises to make nothing appear tomorrow as it does today. The response to my new book Road of Ash and Dust: Awakening of a Soul in Africa has been overwhelming. I wasn’t expecting so many people to, quite literally, read it within hours of publication but that’s what happened. Since October 5th, I’ve donned my marketer’s cap and promotional cape. 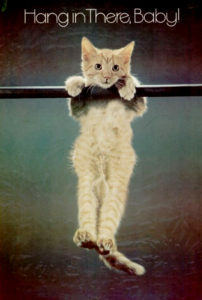 Some of you might remember that poster from he 70’s of the little kitten hanging from a bar mid-air, struggling to stay atop. Well, that’s been me for the past two weeks. I’ll make sure to tweet and blog about it throughout the day tomorrow.